Warm days are returning to Minnesota; time to think about tropical drinks. As luck would have it, Jeff Berry’s Grog Log came to hand the other day, and fell open to his fruit and spice laden Ancient Mariner. According to Berry, the Ancient Mariner is an attempt to recreate the flavors of Trader Vic’s Navy Grog, which was itself an attempt to decipher Don the Beachcomber’s drink of the same name. In the end, the Ancient Mariner is dramatically different from either Vic’s or Don’s Navy Grog; Berry’s drink includes Allspice Dram, sometimes referred to as Pimento Dram. Chefs and bakers among us will recognize allspice as the flavor we associate with harvest pies and winter cooking. It comes from the dried berry of Jamaica’s Pimento bush; some sources suggest we owe its popularity in Western cooking to Christopher Columbus and his second expedition to the Americas. So what is Allspice Dram? Allspice Dram is an infusion of allspice and sugar in rum, and may have other additions as the makers see fit. We owe its invention to Jamaican ingenuity and the rise of the rum trade in the West Indies. Its use seems to have been limited to the islands until WWII, when its popularity spread northward, part of the Tiki repertoire for Trader Vic and Don the Beachcomber. The Allspice Dram is a spicy, sweet and bitter concoction, with flavors of clove, cinnamon, nutmeg and pepper all coming from the allspice itself, and additional infused flavors of orange and other citrus peel and sugars, all blending into the underlying characteristics of the Jamaican rum base. It is assertive and complex, and a natural match for rum drinks. The Ancient Mariner is basically a fancy rum sour. All the basics are there: a solid dose of rum, a blend of fresh citrus juices, and a dollop of sugar to balance it out. It’s the spice that makes it something more than a Daiquiri, and brings that heady mix of cinnamon, pepper, nutmeg and clove to the mix. Shake all ingredients with cracked ice until well chilled; pour unstrained (including ice) into a chilled rocks glass. Garnish with a scored lime wedge and mint sprig. The El Dorado 12 and the Appleton 12 rums blend very naturally in this drink. 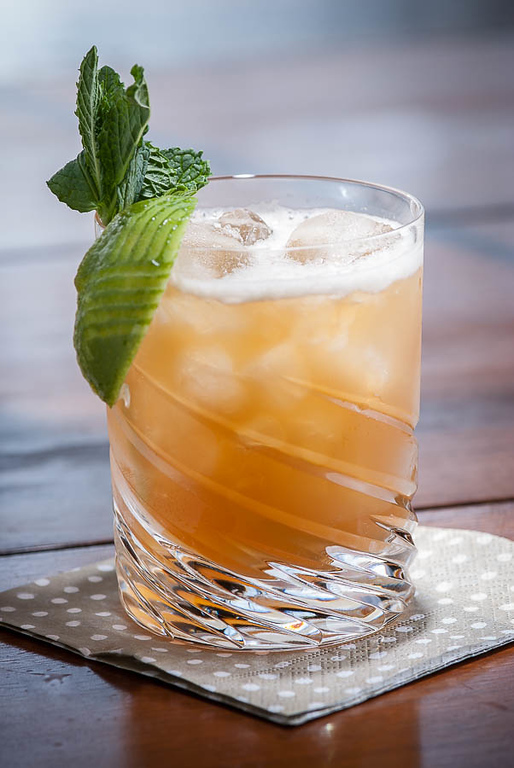 Overproof rums, and the more aggressively flavorful rums like Smith & Cross, are not right for this drink; Smith & Cross is far too dominant a flavor, and doesn’t blend smoothly with the other ingredients. The lime is a natural with rum drinks; the grapefruit is less common, and I’m finding that I really enjoy it as part of the juice blend. Berry’s recipe calls for simple syrup, but the Demerara syrup fits in very nicely with these rums. Berry also calls for ¼ ounce of the Allspice Dram, which is too much for my taste. About a barspoonful, ⅛ ounce, balances the drink perfectly for me. And don’t leave out the mint, if you have some fresh. I can’t explain how it works, but the minty nose seems to integrate the flavors, holding the sweetness down and softening the spiciness of the first sip. “Rum, fruit and spice — The Ancient Mariner” at cold-glass.com : All text and photos © 2013 Douglas M. Ford. All rights reserved. Thanks. The Ancient Mariner reminds me of a streamlined Zombie, with the lime and grapefruit juice combination and the cinnamon notes of the allspice. I’ve only recently started making these, but already I can see why it’s one of your favorites. Looking forward to trying this tonight! I’ve only had a couple uses for my St Elizabeth thus far. I’ve been having trouble fining Demerara rum in my area…any suggestions for a suitable substitute for this drink? Scot, I haven’t tried it, but I would think you could make an excellent drink just using all dark rum, or perhaps a rum that blends from various areas, and which may have a dose of Demerara included with other styles. (Banks, maybe?) Demerara syrup would give a hint of the original direction of the recipe. Definitely use what you have; while it may not be according to original design, it should turn out pretty good. I finally acquired a bottle of Lemon Hart 151 and I can say I’m glad I was patient and waited. This drink is amazing. The grapefruit and the allspice are perfect together. I was looking for a refreshing cocktail to beat the heat yesterday and wanted something more imaginative than a gin and tonic and I remembered being interested in trying it. This is officially my new favorite summer drink. I’m delighted that you found Cold Glass, and even more delighted that the Ancient Mariner turned out to be just the thing. Thanks! I’ve never met Jeff Berry to ask him that very interesting question, so I can only speculate that he was mainly trying to control the drink’s alcohol level. Berry does say in Remixed that he started out trying to emulate the flavor of Trader Vic’s Navy Grog, and that certainly guided his choices. More speculatively, the “original” Navy Grog, as served by the British and American navies, was not a particularly strong drink, and that may have partially guided the choice of rums, too. This is a must try beverage! Doug, that’s about the spiffiest rocks glass I’ve seen in a good long while. It looks similar to how I carve a pineapple. Anyway, I am a long time fan. We started writing at about the same time. We should have gotten together to trade ideas over a drink before I moved to Portland. The cocktail scene is really booming now in MN. Hi, Randy, I’m delighted that you enjoy Cold Glass. You’re right, it would have been good to get together before you headed west.